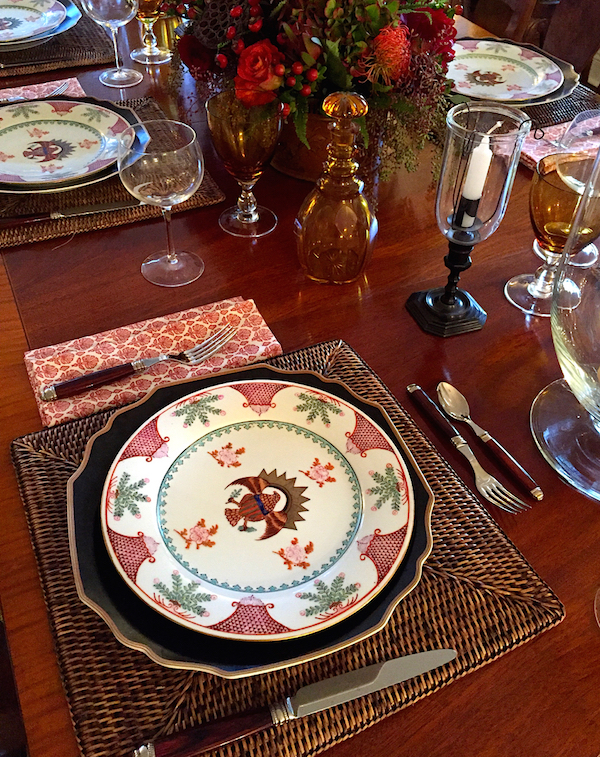 As I prepare my table to celebrate Thanksgiving this year, I am so grateful to have my entire family home on this wonderful day. As my children get older, I do not take for granted that they may have other options for these cherished holidays and am so appreciative that they look forward to being together as much as I do. So from my home to yours, I wish you all a very Happy Thanksgiving. May you enjoy your food, your home and your families, not necessarily in that order!! Since you readers are always a curious bunch and will undoubtedly ask, let me share that my plates are vintage. I found them at a church fair in Little Compton, Rhode Island I attended with Dominique Browning several summers ago. You can see more in my video visit here. 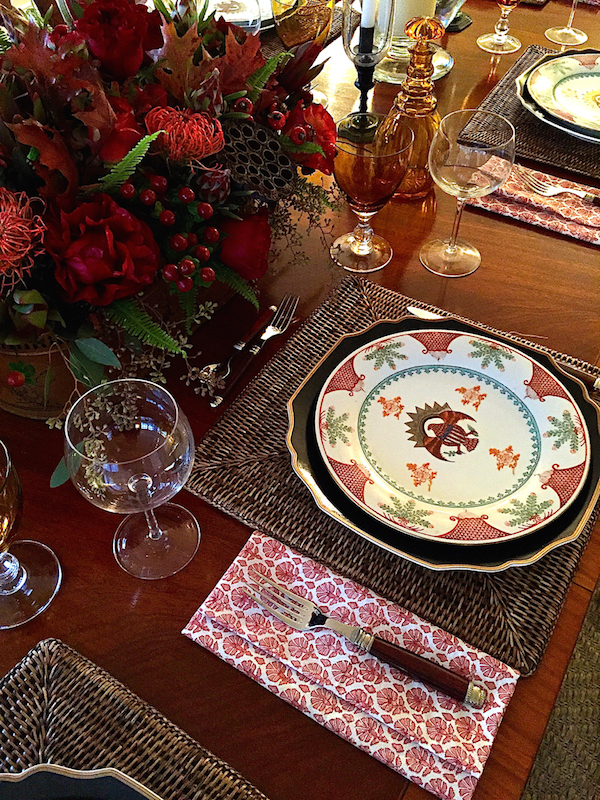 The wonderful amber glasses, with a tortoise shell like ombre are from Nina Campbell, the charges Mottahedeh, the flatware Alain Saint-Joanis from Hoaglands and the napkins, a recent purchase from The Linen Shop. Cheers to a very happy holiday! This entry posted in design, food and drink. Entry Tags: Entertaining, Holiday Entertaining, Holiday tabletop, Thanksgiving Bookmark the permalink. Just lovely, as always. Wishing you and yours a wonderful Thanksgiving! A splendid table! Enjoy your holiday and your family around you! I love the Linen Shop and miss it since my move South! Beautiful table, Stacey. All best wishes to you and yours. Wishing you all a wonderful feast. The centerpiece is beautiful, too. Such a lovely laid table! 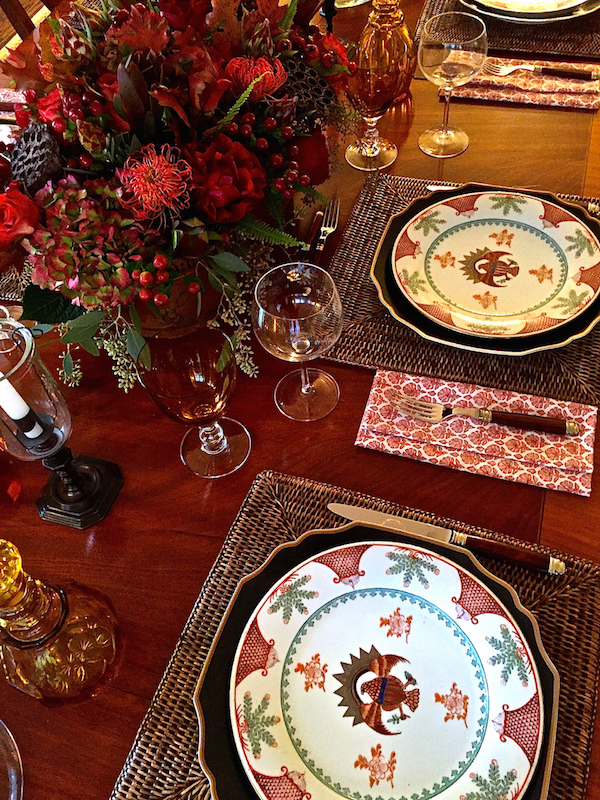 Happy Thanksgiving to you and thank you for your inspiration blog and videos! Loved seeing my glasses on your beautiful table! Thank you for using them, and what great plates, flowers , napkins etc they were with. Do sorry missed the St John’s Bazaar this year. Thinking about want to do for Thanksgiving 2015 ! !